Ulysse Nardin El Toro Perpetual Calendar GMT-Limited Edition to 500. Platinum, 43mm case, automatic movement, with exhibition glass back. It features the day, date, month, and year. When worn daily it will self adjust for months having 30 or 31 days, it will also self-adjust for leap year, and is programmed to the year 2100. 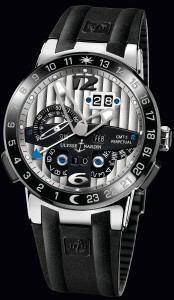 This timepiece also offers the GMT Dual Time function. This means two seperate time zones are always displayed on the dial, with the push of a button you can set the times forward or backward. Shown on a sporty rubber strap with ceramic folding buckle.